The weekly UK charts have seen a number of 3DS titles deliver a decent début performance before falling out of the reckoning; no 2014 releases have yet hit that magical consistency enjoyed by some major titles of 2013. There are more significant games on the way to the portable, of course, and the latest visitor to the charts has at least limited its second week tumble, to a degree. 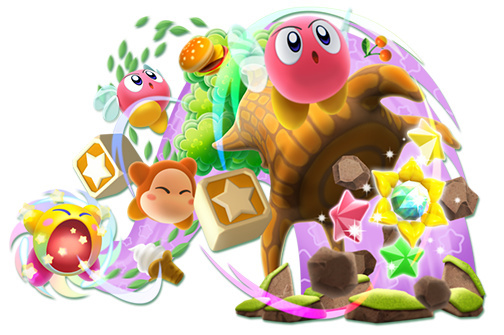 Kirby: Triple Deluxe has dropped out of the top 20 in its second week, but its fall has been gradual enough to suggest it may survive a third week in the top 40. After a top 10 début in the single format charts the platformer has come in 24th this week, while the all-format results have brought a drop from 16th to 23rd, with the quirk of multi-platform releases seeing the 3DS exclusive fare better in the latter category. Pokémon X is the only other Nintendo survivor, securing 40th place in the all-format results. We'll see whether Kirby can go one better than Mario Golf: World Tour and survive a third week. Next week we're likely to see Watch Dogs come out on top with its release on four consoles, though we'll be more interested in the performance of the excellent Wii U-exclusive Mario Kart 8, and whether the racer can even top the individual format charts. Having played Mario Kart 8 I can tell you that it's another a very sold racer in the Mario Kart series but I don't see any reason why it would do anything to help sell the system to more than core Nintendo fans, most of which probably have a Wii U already anyway, and some casuals on the fence. We'll see what kind of impact it makes ultimately but a couple of good solid first party games is not how Nintendo is going to turn around the Wii U situation imo. I reckon Mario Kart 8 will reach number two. Watch_Dogs. It is on the Xbox 360, PlayStation 3, Xbox One and PlayStation 4 compared to one solitary game - even though Mario Kart is a popular series - on the Wii U.
Yeah; there was a time when a release of a major first party title like this on any Nintendo system would basically guarantee the top spot but these days that really isn't so certain any more. Is there enough Wii u's out there to put MK8 in the top ten list. Let's assume that 50% of Wii u owners rush out to buy MK8 in its first week, how many copies would that be? I think 50% is high anyway and not all Wii u want or can afford the game. Also those with Wii u's and 3ds may only be able to afford one game this month so they may resist Mario golf and Kirby to keep their cash for MK8. Or if they are still playing these 3ds titles MK8 may have to wait a few weeks. There is NO SIGN of ANY marketing yet in the UK for mk8. No posters, no tv adverts, no shelf space in stores. Hell, my local game doesn't even have ANY Wii u shelf AT ALL..... NONE! When asked if they sell Wii u's the response was...." I think we can order them if someone asks, not sure"
On the other hand, there are watch dogs posters, cut outs, hoardings, signs on buses....etc.....have been for weeks..... It saddens me to think this is how they handle the 'last big push'! Please someone tell me this is a blip and that that HAVE seen some mk8 marketing outside of gaming sites??? Boy was that a RIDICULOUS statement to make about Nintendo supporting Europe. I THINK I've seen adverts for Mario Kart 8 on TV but maybe I'm just imagining things with all the web ads that have been up over the last couple of weeks. If not then Nintendo REALLY needs a kick up the *ss. I think this has less to do with Kirby having long legs (the character literally has no legs as the feet are connected to the body ) and more the charts being in a bit of a lull which are saving Kirby from falling off. But man, Wolfenstein is quite dominant (25% of all game sales last week). MK8 will be an interesting acid test. Some will go for the pricer eShop release and skip being counted for these charts. The worrying thing is how many stores won't be stocking the hardware bundle and these stores have no Wii U hardware to speak of either. @Artwark They do well in France (Kirby debuted no. 1 there) and decently in Germany. The UK remains the week market it traditionally has been. @ULTRA-64 The update discs and POS stuff for the demo units was sent out to stores on Friday so they should be setting those up (I got to see the update happen in a Toys R' Us store...thing takes ages, as in about 30 minutes and photos and a report have to sent back). But they're missing a trick. The free game promo is not said anywhere, neither pre-order boxes nor the POS. That should be shouted from the rooftops. Then there is the fact fairly few stores have demo units to begin with. As for TV adverts, There will be at least 5 next Monday-Friday on E4 at about 20:10 using user submitted MKTV footage. I just hope those mention the free game...they were saying a while back marketing would be year long. @zool Pikmin 3 came in at number 2, and Wind Waker 4 in their debut weeks. There's enough consoles out there to secure a number one, no doubt about that. Wii U titles have been top ten. As I said before, UK gamers have appalling taste in games. If it isn't FIFA or COD they ignore them. Hope MK8 can break into the top 5 or even better the top 3. Fingers crossed. @JosieC84 It could be said they have good taste in games i.e not bothered about this Kirby but yet the Wii one costs a fortune. I haven't stepped foot on UK soil in about 20 years but it is certainly showing up in the US. I bought a pre-order card months ago at Target -possibly the only Wii U pre-order card I've seen, 3DS has had a handful - and Gamestop's front windows were full - for about 2 weeks until they replaced them all w/ W_D posters. I haven't seen a tv commeircall but I don't really watch tv. The major newspaper flyers did have it though - Toyr R Us, Best buy and Target - despite it not releasing until Friday. Oh and the Target kiosk is all made over in MK8 attire. Not exactly a new apple "i" product, but for a Wii U game this is unprecedented. Easily the most coverage since launch. DKCTF did have some tv ads I saw, and SM3DW, but that was mostly lost amongst the holiday overload. I'ld say it's holding it's own against W_D considering that game is on 5 systems w/ a practically unlimited install base counting PCs (and 200mil w/o) and MK8 has 6mil Wii U. Hopefully 7m Wii U by the end of next weekend. @ULTRA-64 You live in the wrong neighbourhood buddy. Mario Kart 8 is advertised pretty crazy in where I live. @Artwark actualy the 3ds sold very well there. i've even seen a game or two that bombed in na do better their considering install base like mary party 3ds. I dont really care about the UK charts anymore. They are the most anti-nintendo people ive ever seen. Even the USA is more into Nintendo than these island dwellers.